This season I have become increasingly disenchanted with the commercialization of Christmas. I am disheartened by the "holiday Cheer" that has nothing to do with anything holy. But perhaps there is one thing that hurts my heart the most. Remember when the Grinch ". . .puzzled and puzzed till his puzzler was sore. Then the Grinch thought of something he hadn't before. Maybe Christmas, he thought... doesn't come from a store. Maybe Christmas, perhaps... means a little bit more!" "Being with family for the holidays is what it's all about." "Christmas is about giving from the heart." "Sharing and caring are the reason for the season." I'm sure you could throw in a hundred lines of your own. You get the idea. These statements have beautiful sentiments, but they are only semi-true, and semi-fulfilling. I'm not oblivious to the Pagan roots and secular influences where my favorite holiday is concerned. I realize that many speculate that Jesus Christ was born in a warmer time of year. No December 25th most likely wasn't the time that Christ was born if Shephards were out in the fields in Palestine with their flocks. 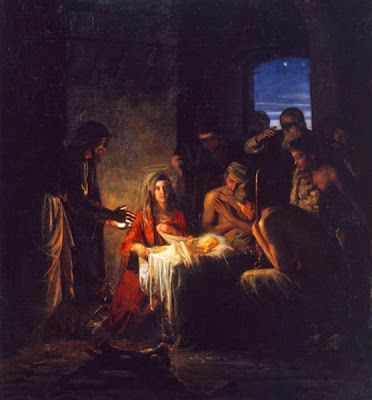 But, as many other practicing Christians, I see this time of year - specifically the 24th and 25th of December as special time set aside to contemplate and remember the birth of the Savior of the world, Jesus Christ. Statements including non-descript references to hope, joy, peace, believing, love, service, miracles, giving, and family any time of year are only semi-spiritual, semi-true, and semi-fulfilling if they do not include Jesus Christ - the source of all those things! The true meaning of Christmas is that because Christ was born - half-mortal, half-God, He was able to atone for us and give us a way to true and Eternal joy that otherwise would have been closed to us. Spending time with family isn't the true meaning of Christmas, but because of Christ's sacrifice, our families can spend time together - forever! All hope, joy, our families, and goodness would have been lost to us if not for Jesus Christ. The gift of God's Son is our hope, our chance at untarnished joy. We give in emulation of that gift and of the Savior's perfect life. I think in all the hustle and bustle this year the greatest thing we can do as Christians, is to show our gratitude to God for the gift of His Son, by giving the gift of better selves to Him, and by recognizing His hand in all that is good.